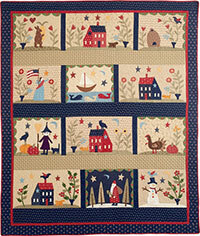 In this lesson, Jan focuses on the Lady Liberty block. First, Jan discusses how to complete the flag Lady Liberty is carrying. She then shows how to baste Lady Liberty’s hands to her arms and discusses the order in which the rest of the figure needs to be assembled. Jan then demonstrates how to baste Lady Liberty’s face to her dress and shows how her hair gets stitched in place on top of both her face and her dress. Once the entire figure and flag are assembled, it’s time to stitch the entire layered applique figure down to the block’s background. This layering process works the same way for the bunny in block 1; the houses in blocks 2, 6, 8, and 10; and other figures which will be shown in future lessons. The stems and leaves on block 4 were demonstrated in lesson 3, the round flowers will be demonstrated in lesson 6, and the star will be demonstrated in lesson 5.